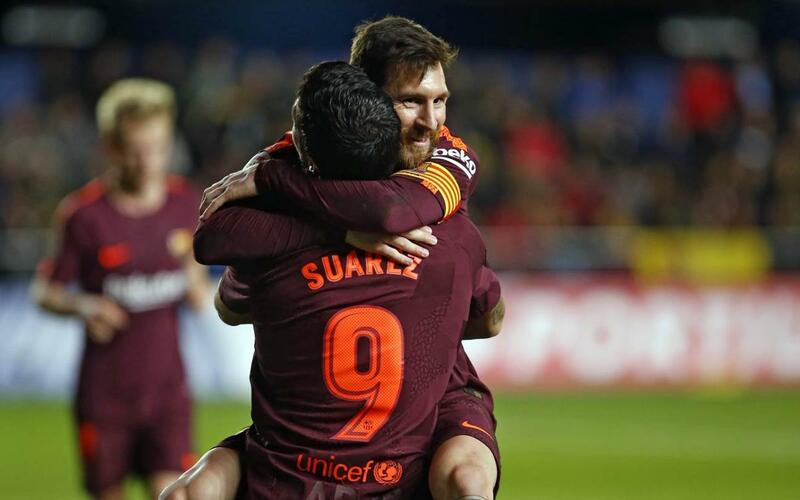 With all of their closest La Liga rivals having already won their Week 15 fixtures, the pressure was on Barça to deliver, and thanks to second half goals from Luis Suárez and Lionel Messi at Villarreal, the Blaugrana remain at the top of the pile. The visitors started the better of the two teams and had already settled into a rhythm when Gerard Piqué’s header from a corner crashed back off of the woodwork in the fourth minute, the 20th occasion that the Blaugrana have hit post or bar this season. A congested midfield meant chances were at a premium, with Villarreal content to play on the counter-attack. From one such move, Marc-André ter Stegen continued his excellent current form, stopping Soriano’s goal-bound effort on the quarter hour. Though there wasn’t an awful lot in the way of goalmouth action in the first 45, the game still had a natural flow to it, and the inter-play from both sides was pleasing on the eye. Lionel Messi would come closest to opening the scoring for Barça, his free-kick well saved by Sergio Asenjo and his low shot just wide of the upright. After the break, substitute Paco Alcácer brought the best out of Asenjo with his first touch, and Messi went closer still with a shot that flashed inches wide. On the hour, Villarreal’s Raba was red-carded for a wild challenge on Sergio Busquets which left the Barça midfielder prone. Consistent pressure from the visitors eventually got its reward. A give-and-go between Alcácer and Luis Suárez with 20 left to play saw the Uruguayan round the keeper and slide Barça ahead. Villarreal had no answer to wave after wave of attacks and poor communication between their defenders allowed Messi to nip in and score a late second to settle the match. Barça are next in action on Sunday, December 17, against Deportivo La Coruña at Camp Nou (8.45pm CET).